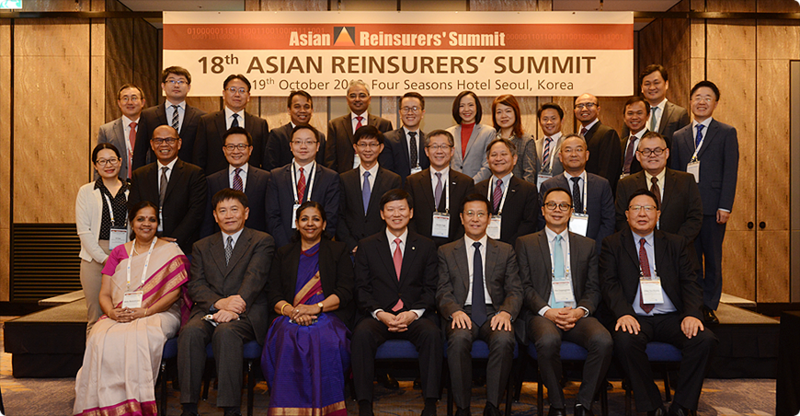 Korean Re hosted the 18th Asian Reinsurers' Summit (ARS) in Seoul from October 17-19, 2018 with the presence of 29 delegates from 13 companies in 12 jurisdictions in Asia. The ARS is an annual gathering of 15 Asian reinsurers, which aims to exchange reinsurance market information and promote cooperation among the reinsurance companies. During this year's summit, participants were given presentations on latest issues in the insurance industry such as InsurTech and IFRS17 as well as the opportunity to discuss information on reinsurance market trends and developments in Asia. Korean Re CEO Jong Gyu Won said in his welcome speech, "I hope this summit will help us further strengthen our cooperative relations with one another in a way that reinforces the standing of Asian reinsurers in the global market."